The PMC-37Pro is a large 3-channel mixer: At nearly 12-by-16 inches, it is only a couple of inches smaller than a standard turntable. Scratch DJs who are used to 8- or 9-inch-wide mixers may be put off by its large size, but it still sits nicely between a pair of turntables. 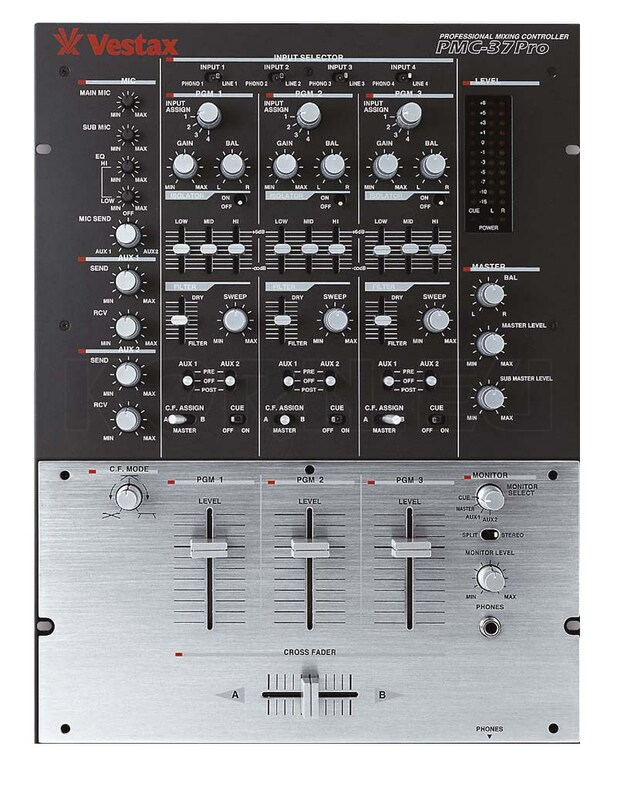 All of the PMC-37Pro's controls are located on the top two-thirds of the mixer's faceplate. The PMC-37Pro boasts greater flexibility than typical mixers; however, this flexibility results in a wide array of switches, dials, faders and knobs. Although they are arranged in a well-organized fashion, their sheer number can be daunting, especially when some of their functions are not immediately obvious. It takes some experimentation and time to get used to the unit's myriad features. The mixer's metallic case is solidly made and features a double-panel system around the faders that can be removed for servicing. The PMC-37Pro uses VCA circuitry, and its main faders and crossfader are high-quality PCV-type. All of the other knobs, switches and faders have a solid feel. 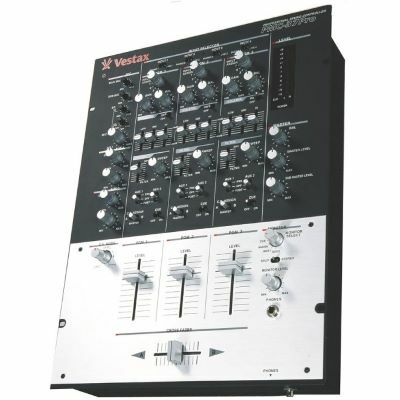 The channel faders can also be replaced with the shorter-throw version found on the Vestax PMC-05Pro. The rear panel of the PMC-37Pro is fairly well-organized considering that it is packed with numerous input and output connections. The power switch is quite small and located below the master output jacks. Although this design does make the power switch difficult to reach, it prevents users from accidentally turning off the unit while it is in use. Inputs include four phono with separate ground terminals, four RCA-jack line-level, two ¼-inch effects sends and two mic (one XLR and one ¼-inch). Outputs include two ¼-inch TRS balanced master; two ¼-inch unbalanced, which can be used to power a booth monitor amp or a second sound zone; and a pair of RCAs for hooking up to recording equipment. The crossfader is clear of any obstructions — a key feature for scratch DJs. The C.F. Mode dial, located at the top left of the main fader section, allows adjustment of the crossfader's cut-in time, from smooth (for club-style blends) to steep (for advanced scratch techniques). 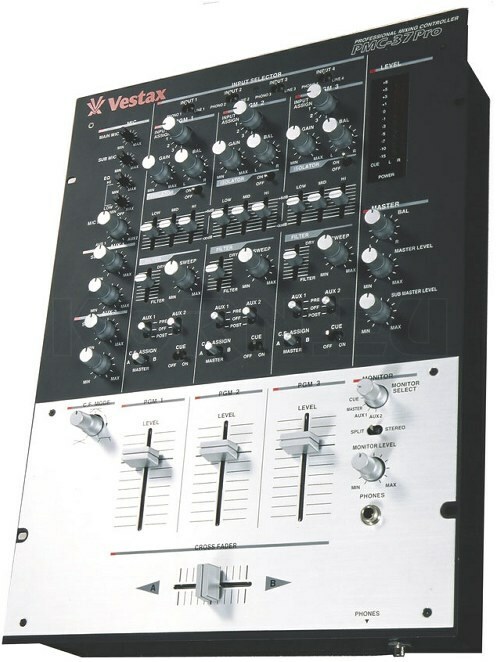 The crossfader has the typical Vestax feel: It moves very smoothly but makes a loud metallic click when moved to its extremes during fast scratching. The click is not heard through the audio signal; it is a physical noise related to the fader and case design. The crossfader cut-in is impressive: Less than 2 mm of movement is needed to turn the signal from full off to full on when the cut-in time is set to its steepest setting. OUTPUTS: Master out: stereo ( -4 dB; Jack ¼ inch bal. ); SUB Master out: stereo (-4 dB Jack ¼ inch bal. ); Cue out: stereo (-10dB RCA) Monitor headphone out: stereo (150 mW; Jack ¼ inch); Aux. send: Stereo(-10dB; Jack¼ inch) x2.